“I’ve told you to clean your room 1,000 times!” Why nagging your child, yelling and repeating yourself don’t work—and how to talk to your kids so they will listen. Here’s the truth: nagging and arguing with your child doesn’t work. We parents often get in a rut—out of stress, frustration or just not knowing any other way—and so we do the same thing over and over again, expecting different results. It’s important to understand that yelling and nagging won’t get you anywhere—and will ultimately create a negative pattern in your relationship. When you do this, all your child will learn to do is tune you out. This allows them to gain more power and control, rather than becoming more responsible. Let me stop here and say that I know firsthand that parenting isn’t easy. Parents today experience stress in all parts of our lives—–financially, at work, and with a host of family demands. The idea of having to deal with difficult issues with your child can become overwhelming, especially when you feel like you’re yelling and repeating yourself and no one’s listening. When that happens, our frustration just spills over and we become even less effective. Sometimes, even if you realize that nagging and arguing with your kids isn’t getting them to do their chores or be more responsible, doing things differently can feel like it would take too much energy and time. It just becomes easier to go back to the default system—even if it doesn’t work. So, Why Doesn’t Nagging Work? When you come to the point where you are sick and tired of getting no results with your child, you are probably sick and tired enough to try something else. There are techniques to get our kids to do chores, homework and their other responsibilities that work, and others (like nagging and fighting with them) that usually don’t. Focus on one chore at a time: In order to change behaviors, don’t try to take on too many things at once. It will just overload both you and your child. It becomes overwhelming to try to change too many things at once. Pick the most bothersome problem—let’s say it’s putting their dirty clothes in the hamper—and start there. This focus will help both you and your child set realistic expectations, follow-through, and ultimately succeed. Plan how you are going to intervene differently: Not nagging, pleading or yelling may feel strange and uncomfortable to you at first. Act as if you are confident and you mean business. If you’re able to do this, you will learn how to be more comfortable over time. Changing our behaviors as parents can feel strange and new, and maybe even a bit disingenuous in the beginning (it’s hard to bite your tongue when you really want to let loose!) but we need to be good actors. Understand that it’s the change in our behavior that will catch our kids off-guard. They have become used to the same repetitive requests and yelling from us, not unlike a mantra or chant—or white noise that they have gotten good at completely ignoring.Kids get so used to it, in fact, that they know exactly what we’re going to say, and how far things go before they have to respond. We say things like: “Do the dishes—I mean NOW!” and then neglect to follow through on the limits or consequences we’ve set. Instead, try saying calmly and with authority, “Your responsibility this week is to do the dishes. Please get these done before you watch any TV tonight.”—and then turn around and leave the room. I had an experience with my son when he was young where he really wanted a plastic sword at the grocery store, and he became quite demanding. I said, “Stop it” and “no” a few times, to no avail—his screams just got louder and louder. When I saw it wasn’t working, I thought about how I could respond differently. I decided to be honest and tell him why he wasn’t getting the sword – because I had already bought it for him for Christmas. He really didn’t want to know that, as it spoiled the surprise, but he immediately stopped demanding it and still remembers that interaction to this day, as a fully grown adult. The point is, instead of our nagging and arguing becoming louder, harder and more intense, we can find alternative ways to communicate our expectations. After doing this for a while, you will see your child take notice and begin to show that they know that you mean business. It’s important to remember that our kids really want structure and limits from us because it makes them feel safer. We also become more comfortable as we gain success and realize we can have an impact on our kids’ behavior without resorting to nagging and arguing with them. If you’re having trouble establishing your authority as a parent, you may even go so far as to plan where you sit to reflect that you’re in charge. A single mother I knew planned to tell her kids the new clear expectations at the dinner table after dessert while sitting at the head of the table. It was her first step toward taking charge of her family again, and it set the tone for future positive interactions and a better relationship with her kids. Be clear about consequences for not doing the chores. Be up front about consequences if your kids don’t follow through on their chores. Don’t box yourself in, but let them know what the results of their actions—or lack of actions—will be. Make sure the consequences you set up are age-appropriate. For a teen it might involve use of the car, for a younger child it might be reflected in what they get in their allowance (or if they’ve earned one that week) or whether or not they can have a friend over. For younger children or kids who are pretty disorganized: With younger kids, kids with ADHD or those who lack organizational skills, you may need to help them figure out how to approach a task. Some of their resistance to your nagging may have to do with their inability to know where and how to begin. Their room may be so messy and full of stuff that they really don’t know where to begin and simply give up. You may want to take time to start the organization process to ensure ultimate success. You can say, “Okay, let’s start with your dirty clothes, then your bed, then the floor…” and take it from there. 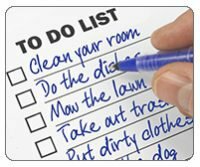 A chore chart or a list of things they need to do to complete the chore might also come in handy. It’s important to remember that the goal with setting expectations for our kids and holding them accountable is to make them responsible, successful members of society. Always ask yourself, “What does my child need from me right now?” Nagging and arguing won’t help you get to your goal, but setting clear expectations and following through will.